Can anyone suggest any shrubs that will grow in shade. We have recently cleared some old yews from an area about 6ft by 8ft. We've left a lovely fir tree in place which is about 20ft high 4/5ft spread - it's a beautiful tree. This has left a large space to fill which is shaded by the tree & unfortunately opened a gap between our neighbours. We would like to plant some shrubs for different seasons, birds & wildlife. Really the thorny & lollapy the better. The soil isn't that great due to the tree but we're hoping to get some manure & topsoil dug in. Bordering one side are some lilacs which we have reduced the height of but have kept because the butterflies adore them - they of course make more shade! Pyracantha has plenty of thorns and has plenty of flowers and berries for wildlife. The one next door to us attracted a lovely flock of waxwings the other year. 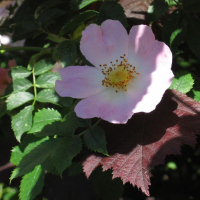 It’s tolerant of a reasonable amount of shade and copes with most soil types once it’s established. The native Common Hawthorn Crataegus monogyna has similar virtues and makes a dense thorny barrier. Both respond happily to cutting back/ clipping so you can keep it within its allotted space. Mahonia aquifolium is prickly, has lovely flowers followed by berries which the blackbirds love, it grows well in a shady part of my garden.